Mohammadi Kamrava, H., Barati, M. (2011). Magnetic Properties in a Spin-1 Random Transverse Ising Model on Square Lattice. International Journal of Nanoscience and Nanotechnology, 7(3), 133-136. H. Mohammadi Kamrava; M. Barati. "Magnetic Properties in a Spin-1 Random Transverse Ising Model on Square Lattice". International Journal of Nanoscience and Nanotechnology, 7, 3, 2011, 133-136. Mohammadi Kamrava, H., Barati, M. (2011). 'Magnetic Properties in a Spin-1 Random Transverse Ising Model on Square Lattice', International Journal of Nanoscience and Nanotechnology, 7(3), pp. 133-136. Mohammadi Kamrava, H., Barati, M. Magnetic Properties in a Spin-1 Random Transverse Ising Model on Square Lattice. 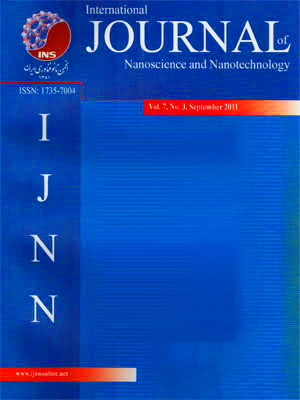 International Journal of Nanoscience and Nanotechnology, 2011; 7(3): 133-136. In this paper we investigate the effect of a random transverse field, distributed according to a trimodal distribution, on the phase diagram and magnetic properties of a two-dimensional lattice (square with z=4), ferromagnetic Ising system consisting of magnetic atoms with spin-1. This study is done using the effectivefield theory (EFT) with correlations method. The equations are derived using a probability distribution method based on the use of exact Van der Waerden identities. We present our numerical results, such as the phase diagrams, the thermal variations of the transverse magnetization, the internal energy, the magnetic specific heat as a function of different values of p, the concentration of the random transverse field. As a result, the critical values of transverse field , temperature and concentration were obtained for the square lattice.